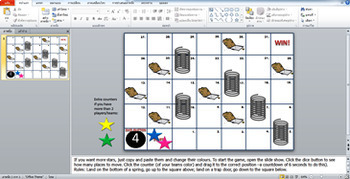 This is an interactive PowerPoint game that is an alternative version of snakes and ladders. 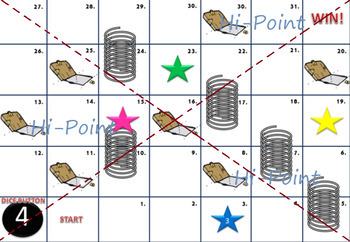 The idea is to provide a little variety but still with the simple principles of the original classic snakes and ladders game. Instead of going up a ladder, they bounce up to the sqaure above if they land on a spring. If they land on a trap door, they fall down to the square below. This game is ready to use - just project it onto your projector screen or interactive white board. No need to turn your back to the class to draw a game with your pen. The clickable dice and the counter movements (click and drag) are embedded into the PowerPoint show - you don't have to exit PowerPoint Show to move things around, it all happens within the show. No more drawing the grid on the whiteboard. No more picking the dice up off thee floor again and again. No more moving kids’ counters around the board for them. How does it work? Open the PowerPoint (it's a macro enabled PowerPoint file) and start the slide show. A student from team A can click the interative dice button and then, to move their colored counter to the correct position (without exiting the slide show), they click it and move the mouse to position the counter in the right place (6 seconds to move the peice). Team B then has a turn. It's all done within the PowerPoint show, no need to pause and edit the slide manually. You can see this functionality in action by viewing the preview video. Happy days! Hope this gives you a little simple variety to a classic game for the classroom, like it did for me. I've used it at various levels in a private school in Thailand (and on the odd occasion with adult learners). The board is blank and you can edit it (add text or pictures / move/add/delete the springs and trap doors if you wish). Note: Be sure to "enable/allow content" when opening the file so the macros can run. Click here to get notifications about my new resources and free products. Angels, Bombs, and Guns Interactive PowerPoint Game. Interactive Cartoon Superheroes and Villains PowerPoint Game.